Blue Rebel Energy Drink is made by Dutch Bros. Coffee, a popular coffee chain with around 200 locations in the USA. 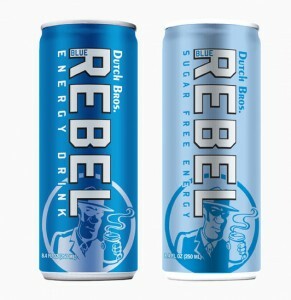 Blue Rebel is available in original or sugar-free and is similar in taste and ingredients to that of Red Bull. Sugar content: 26 grams (per 8.4 ounces). How Does Dutch Bros. Blue Rebel Energy Drink Compare? Dutch Bros. Blue Rebel Energy Drink contains 9.52 mgs of caffeine per fluid ounce (32.20mg/100 ml).